Watch for possible gluten cross–contamination. This means foods that have gluten in them that have come in contact with gluten–free foods. 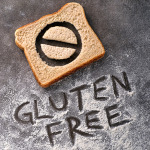 Be aware of gluten cross–contamination at deli’s, buffets, and salad bars.